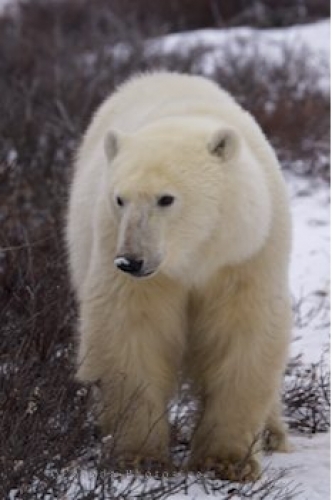 While scanning the frozen tundra in the Churchill Wildlife Management Area in Churchill, Manitoba, one never knows from which direction the next polar bear will be approaching from. This Polar Bear comes out from behind the dry tundra bush to see if there are any signs of danger nearby. While on the tundra buggy tours through the Polar Bear's habitat, one must always stay inside the vehicles, as no one can ever be sure of what an approaching Polar Bear may do. Picture of a Polar Bear approaching from behind the tundra bush in Churchill, Manitoba.